I have added this crochet granny washcloth uk format to my granny collection, it is also an addition to my spa theme items, washcloths are easy and quick to crochet, great for selling at craft fairs and bazaars or to give as gifts, they are ideal to make whether you are a beginner crocheter or a skilled one. Second Row – 3ch, miss 2tr, 3tr into the first space between 2tr and 3tr group, * miss 3tr, 3tr into space between next two 3tr groups, * rpt from * to * to last tr and 3ch to turn with, miss tr, 1tr into top of 3ch. Turn. Third Row – 3ch, 1tr into base of 3ch, * miss 3tr, 3tr into space between next two 3tr groups, rpt from * to * to last 3tr and 3ch to turn with, miss 3tr, work 2tr in top of 3ch. Turn. Border – 1ch, 1dc into base of 1ch, 1dc into each tr to end, 3dc into top of 3ch, work 33dc evenly into row ends down first side of cloth, 3dc into corner, 1dc into each ch along starting chain edge, 3dc into corner, work 33dc evenly into row ends up second side of cloth, 1dc into corner, ss to first dc on beginning of row. Turn. 2nd Row – 1ch, 1dc into base of 1ch, 1dc into each dc to end, working 3dc into corners, ss to first dc on beginning of row. Turn. Rpt last row once. Turn. 5th Row – 1ch, 1htr into base of 1ch, 1htr into each dc to end, working 3htr into corners, ss to first htr on beginning of row. Turn. Fasten off. Finishing – Weave and trim off any loose ends. 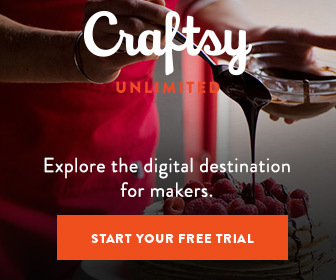 Use this pin to pin to your boards. The written instructions and the pictures for this crochet granny washcloth uk pattern are copyrighted to crochet ‘n’ create © 2018. 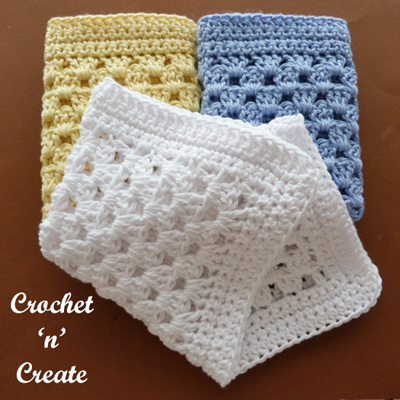 You are welcome to sell the finished products made from the free crochet granny washcloth uk pattern, I just ask that you use your own pictures and put a link back to crochet ‘n’ create. If you wish to tell your friends and followers about this pattern, please only use a direct link to the pattern page on crochet ‘n’ create. 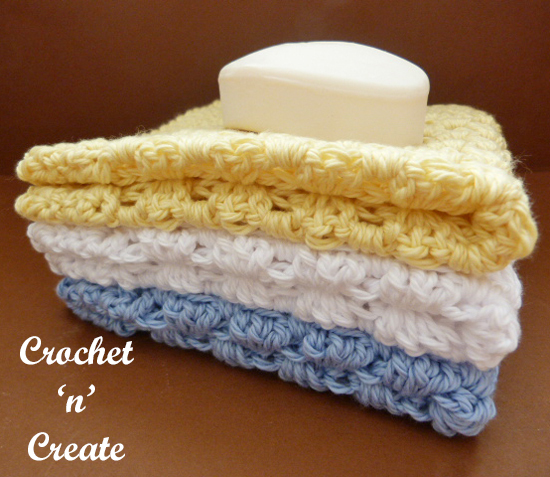 DO NOT share the written instructions for this crochet granny washcloth uk pattern. 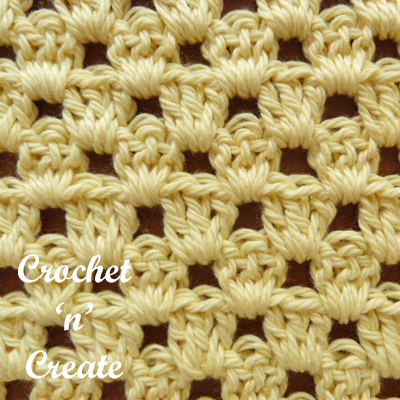 This entry was posted in crochet washcloth and tagged crochet, crochet for home, free crochet patterns, free crochet washcloth pattern on 24th April 2018 by crochetncreate.